Arctic sea ice extent (or area covered) reached its seasonal low this year on September 14th, hitting its second lowest level since satellite data collection began thirty years ago, not quite reaching the record low of last year. The near-record low “strongly reinforces” the 30–year downward trend for Arctic sea ice extent, a full 34% below the long-term average from 1979 to 2000, and only 9% greater than the 2007 record low. Conditions at the end of the growth season in the spring of this year were key to the outcome of this year’s seasonal melt. In March, a record 73% of the Arctic Basin was covered by thin, first-year ice. Despite the cooler conditions in the Arctic this year, the thin ice set the stage for the extensive ice loss. This August saw the most ice loss in the Arctic Ocean than for any previous August on record. Scientists say that much of the thicker sea ice, taking years to develop, has has given way to younger, thinner “1st year” ice, leading researchers to conclude that 2008 likely represent a record low in sea ice volume , if not sea ice extent. The arctic is fundamentally changing in character, and we’re going to continue this downward trend and eventually reach the point when we have entire sea-ice melts during the summertime”, said Walt Meier, a principal research scientist at the National Snow and Ice Data Center located in Boulder, Colorado. 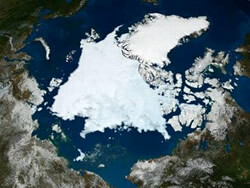 The polar region acts as a “giant air conditioner”, stabilizing temperatures and weather patterns for the entire globe. The rapidly changing conditions in the Arctic weakens that stability and will have “major, if unknown, consequences far beyond the top of the planet”. As the sea ice melts, more ocean is exposed to the sun, which is darker and absorbs more heat from the sun, further melting the ice and starting one more positive feedback loop accelerating climate change. If ever there was a “canary in a coal mine” in terms of global warming (a somewhat ironic phrase in this context), it is the Arctic.